What happens when we die? What religion is correct? We may never know the answer to the greatest mystery. I believe there is truth to every religion. Though, I am not religious, I am spiritual. A theory I find intriguing is eternal return / recurrence. Hi everyone! In this video I thought I’d share with you what my religious, spiritual beliefs are. As a warning first and foremost, these are entirely my beliefs. I’m not forcing my opinion on anyone, nor do I wish for anyone to force their opinion and views on me or anyone else. You are free to believe whatever you like and so am I.
I am not religious. However, I am a very spiritual person and this is extremely important to me. I don’t believe any religion is completely accurate, but I believe there is truth to every religion. Religion is something that separates us, makes us argue and get into conflict, which is something I am very much against. Religion is a way of providing an answer to the unknown. We are human beings and scared of the unknown. When we do not know something it intimidates us, scares us. And, for a question like, “What happens when we die?” having an answer to this unknown mystery helps us live with a better understanding of our role in this world. My views are very open. I am not an atheist, I do believe in a higher power. Whether or not that is a higher power that created us is open for debate. Though, I am very open to the idea of atheism, or any other belief for that matter. But, the universe is vast and we only know a small fraction of what there is to know in life. So, it only makes sense to me that there are other life forms, perhaps even those of higher intelligence, that live somewhere in the universe. A very interesting concept I learned about was through a video game actually. Not necessarily the game, but the story and cinematics. The games are the Xenosaga series. There are three in the series. If you are interested in watching the story for any of these, just click on the name here on the side. Or check the description of this video. [Xenosaga I | Xenosaga II | Xenosaga III] Hopefully the videos will continue to stay online. The cinematics for all three games total nearly a whole days worth of content. The story is science fiction and is quite complex. You will have to pay attention to detail, perhaps even watch it several times. As well as do a lot of research after watching it to understand the entire picture. There are a lot of elements in the game’s story that are based off of many philosophies and religions, including Christianity. I found this so intriguing and it was one of the best stories I have ever seen, especially for a video game. The story opened my eyes. I absolutely love the character Wilhelm from the game. I love the mystery of him, and just the story of the game in general. So, check it out if you are interested. Anyway, the basic theme is the philosophical theory eternal return, or eternal recurrence. It basically means that the events that occur in the universe have been recurring and will continue to occur an infinite number of times. In other words, there is no beginning nor end to the universe. It repeats itself indefinitely. So everything you and I do, we will continue to do each and every time the universe repeats itself. 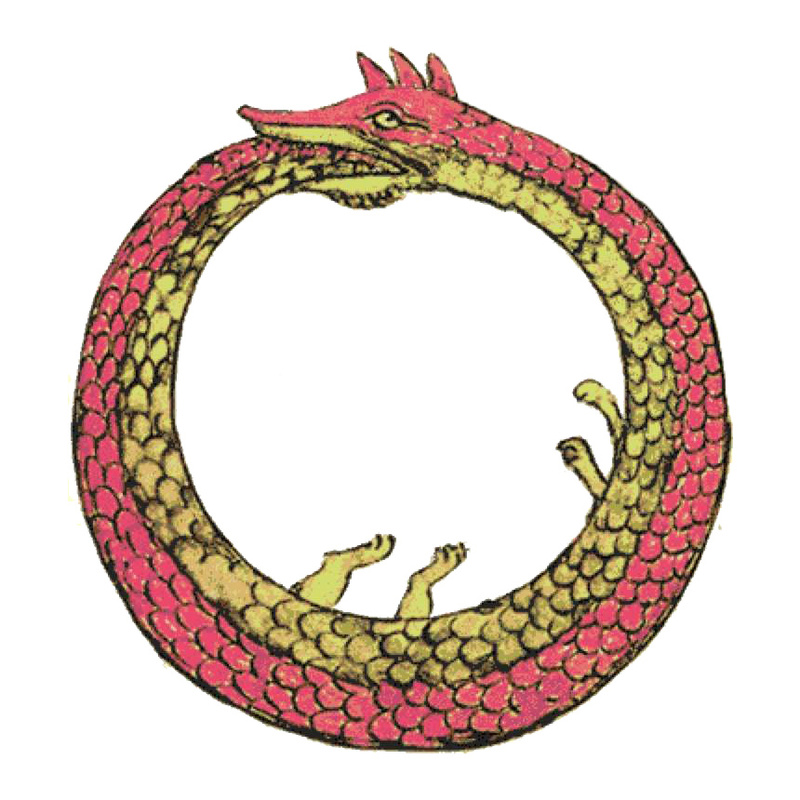 The Ouroboros is a symbol of this theory. My senior year in high school, for my research paper, I discussed this theory including elements from the game. It needed to be presented in front of the class, and we needed to do a PowerPoint presentation. However, I did not. I went up in front of the class and talked freely, writing on the board. I needed special permission due to the length of my presentation, which was practically half the class period. I wanted a topic that was different than everyone else so the presentation didn’t seem redundant, as well as something everyone would be interested in. Despite the fact that several people were saying, “Why didn’t you pick something simpler and easier to understand,” I think I really captured the attention of the class as everyone seemed very intrigued and there were many questions. Anyway, we are not aware of the universe indefinitely repeating itself. Additionally, our every action is ruled by fate. We cannot change fate. We are destined to continuous repeat our lives an infinite number of times in a predetermined fashion. Of course, this can sound like we do not make our own choices and decisions. But, the decisions we make are part of our fate. Each and everyone of us has a destiny to fulfill. We all make an impact on this world. Whether it be small or large, directly, well acknowledged, or indirectly, not well known. We all do have a purpose. Not everyone finds their purpose in life, but when you can become aware of your life’s purpose, it makes it a very exciting endeavor. So, I will discuss my beliefs, and other various materials and data. I’m not going to go into extensive amount of detail, but I will do my best at explaining things. The universe began with the big bang. The universe is vast and continues to expand. However, there are many theories as to how the universe will end. One is the big rip where the universe would continue to expand exponentially and the elements would rip. Another is the big crunch where the universe would eventually collapse in on itself. This may lead to another big bang. When it comes to the belief of God, we do not reside on the same plane as this higher power known as God. We reside in a domain lower than that of God. We cannot gain access to this domain that God resides in. Furthermore, our domain consists of both the physical realm where the three physical, spatial dimensions exist, length, width, and height. But, it also consists of our consciousness, will, spirit, which is not composed of matter and thus does not take up space. Our consciousness resides in this domain. The collection of consciousness is how we are all interconnected. The physical domain we reside in is where we diverge. Perhaps another interning concept is that the collection of all of our consciousness is God. Just fragmented parts of this collective subconscious scattered about to create a vast array of unique creatures. Or perhaps there is no God and just the collection of our subconsciousness as a whole. Everything in the universe being interconnected on a subconscious, spiritual level. It’s an interesting concept that is open for debate. Anyway, when our physical body dies, we continue to live on. Our spirit does not die. Now, what about spirits of the dead, ghosts if you will. Even though I dislike this term. Those are spirits that have not entered the collective subconscious. Those that refuse to acknowledge that their physical body has passed away, or perhaps for many other reasons. Whatever the case may be, I find this to be the most logical reasoning behind spirits in our physical world. It is interesting that many locations that tend to show signs of spiritual activity are those that have severe trauma, unnatural deaths. For instance, a murder scene will have much more traumatic energy in the environment. Psychological trauma is a key element in the spiritual activity of the environment. The biggest question then is why? Why is trauma so lingering even after death? Why do traumatized spirits tend to stick around? Or, is it the environment causing interference? We do not know this, but trauma directly seems to play a big role. The spirits are not at rest and thus do not enter the collective subconscious. When we learn to access our intuition and subconscious, through mediums such as meditation which can allow us spiritual enlightenment, we gain a deeper understanding of ourselves, our purpose, and the world we live in. We can learn to be introspective to identify what is going on in our lives, what is missing and what needs to be changed, all to improve the quality of our life. So, what happens when we die? Is there an afterlife? Is there a God, or a higher power? We do not know for certain. There are so many mysteries in this world that we do not know about, and probably won’t ever know. Keeping an open mind is the only way to truly accept whatever fate has determined for us. Whatever our lives are destined to be. Whatever happens to us when our physical bodies dies, or anything else. It’s good to keep one’s mind open to new possibilities and theories since the only definite answer we do have is that we do not know the answer. I am not a religious person by any means, but I consider myself a very spiritual person. I practice meditation daily and it has helped me in many ways, mostly with my mood and emotions. I could never control them, but meditation allowed me to. As for how I became a spiritual person, well it was concepts learned through video games actually. Specifically Psi-Ops, which I learned about psychic abilities and wanted to move things with my mind, so I learned that meditation was the way to go. The Xenosaga series was another that expanded my mind on the universe and the concept of life and life after death. These were two life changing moments in my life and it was no coincidence that these games crossed my path. I even put a disclaimer at the beginning of the video stating that I was not forcing my beliefs on anyone, and that I would appreciate the same in return. Well, I figured that people would be coming over, reciting passages from scripture, saying I was a demon, that I’m going to hell, etc. Funny stuff!